Sadly, Blood 48:14 isn't a real video game. When illustrator and video game artist Nicholas Beales needed to come up with a game design idea for his school's final year project, he turned to the human body for inspiration. 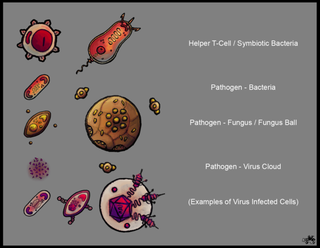 He imagined a real-time strategy game in which the player controls microscopic pathogens as they attempt to take over an infected human body, and created a neat set of concept designs for the pathogens and the militant blood cells that fight them off. What's particularly intriguing about Beales' concept for Blood 48:14 is that once a particular pathogen takes control of a human body, the pathogen would be able to change and operate the human, turning the game into an RPG set outside the human body. (He has concept art for that portion of the game in his Behance and deviantART galleries.) But based on these designs, I would have been happy to keep plugging away inside the bloodstream, letting my bacteria face off against fungi, avoiding possession by viruses, and hoping to outmatch the white blood cell corps. Top image: Pathogen Unit and Helper T-Cell Designs.